Directional and Horizontal drilling is the practice of drilling non-vertical wells. Typically, it is a minimal impact trenchless method of installing underground pipe, conduit, or cables in a relatively shallow arc or radius along a prescribed underground bore path by using a surface launched drilling rig. Since the 1920s, service companies have used established methods based on years of prior experience to advance science toward modern techniques. Directional Drilling has continually improved its practices and progressed to what we use today. 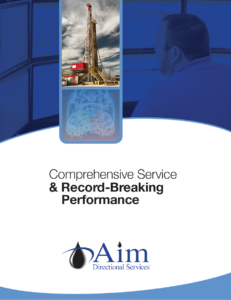 Aim Directional Services offers a high level of performance through our proven results. We focus on accurate wellbore placement with maximum performance. Additionally, we have developed a highly-qualified team in our Downhole Operations, Technical Operations, Sales, Motors and MWD departments. All of which are focused on achieving maximum job performance and customer satisfaction. A = Acquiring all necessary data for the job. I = Implement the proper processes, people and equipment for success. M = Measure the results of our performance upon the completion of the job.